If I’m keeping things simple, I’ll turn leftover chicken into a soup with rice and vegetables. With this soup recipe, I’ve added the classic Indian spices along with sweet butternut squash. The squash blends beautifully with the other flavours. With apple season wrapping up, there’s no reason not to try a fresh spin on this classic soup by adding a touch of butternut. 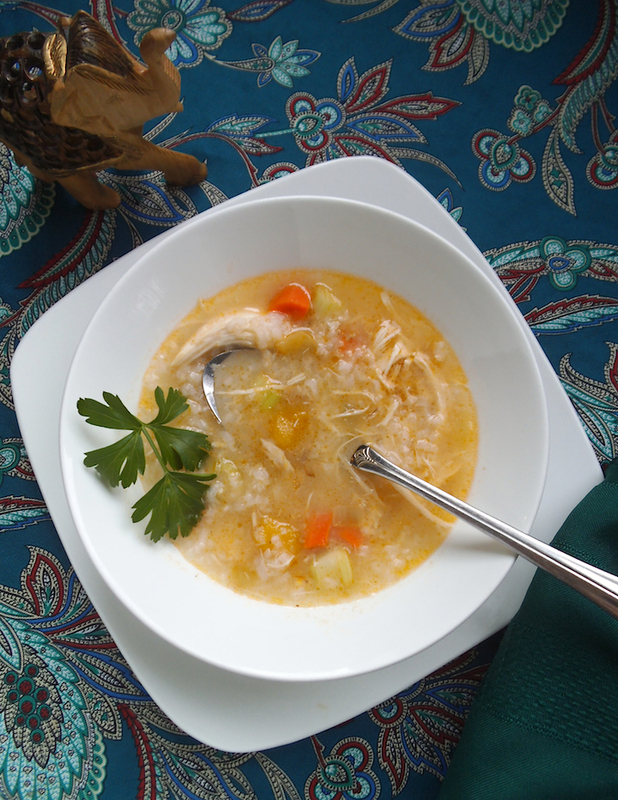 Soup is also an optimal way to use leftover turkey or chicken from weekend dinners and Thanksgiving feasts. By saving your poultry carcass you can craft a nourishing post-feast soup to carry you through the busy days that follow. Making homemade soup from poultry bones means that it is healthier and more frugal than prepared broth or bouillon. Bone broth is a highly beneficial source of protein and nutrients that offer what bodies need, especially as we enter cold and flu season. My whole family enjoys homemade soup, and this one was just what the doctor ordered this weekend. Combine first five stock ingredients, including chicken, in a large pot. Add 6 to 7 cups of water and bring to a boil. Simmer, covered, for one hour or until chicken is cooked through. Remove chicken and bones from the pot and let cool. While chicken cools, add butternut squash and salt. Remove any meat from the chicken bones and chop or pull into small pieces. Discard bones and return chicken pieces to pot. Add rice and simmer for 10 minutes. Adjust salt and spices to taste. Ladle into bowls and serve immediately. I share recipes here and at Allergy Free Wednesday. My kiddos are sick this weekend and this soup sounds perfect for getting them back to their healthy self! I love all the spices in here and I can’t get enough of butternut squash lately! This looks so comforting and delicious! That’s exactly why I made this soup. You can also squeeze in a bit of lemon or lime juice after serving to add vitamin C. I enjoyed it that way for lunch today. Hope your family feels better soon! This sounds a lot like a soup that we make with leftover turkey during Thanksgiving. Will have to try adding butternut squash too. How do you typically spice yours? With black pepper? Oh a perfect soup for the Autumn. Thanks for sharing.